Looking for IBM Infoprint 1634 Parts? A powerful 500 MHz processor and 128MB of memory produce first-page-out-times as fast as 10.5 seconds1 for monochrome and 11 seconds1 for color, giving small and medium workgroups the ability to produce high quality output whenever it is needed. The IBM Infoprint Color 1634 Express includes tools to help you control color print access, produce consistent print quality and help keep confidential jobs secure. Add wireless networking support or an additional paper tray when you're ready to boost the performance of your investment. A duplex model, high yield use and return cartridges and an intuitive operator panel are all designed to improve user productivity while reducing the number of user interventions. On demand, high quality color In-house color printing allows you to dynamically develop and print more engaging color marketing collateral, invoices, memos, handouts, proposals and business graphic materials while saving costly, time-consuming trips to external print shops. 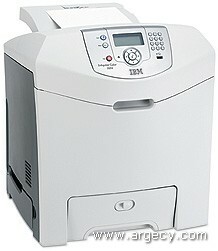 The IBM 4931 Infoprint Color 1634 Express is the replacement for theInfoprint Color 1534 workgroup printer. This powerful color printer provides versatile, cost-effective printing that is an excellent alternative to inkjet printing. With its low-cost, flexible networking options and robust memory and hard disk options, the Infoprint Color 1634 is the perfect printer for small to medium workgroups and businesses. The 4931 Infoprint Color 1634 Express Model 301 has 128 MB standard memory, 640 MB maximum memory, a 500 MHz processor, and a USB port. Duplex capability is not available on this model. The 4931 Infoprint Color 1634 Express Model X31 has 128 MB standard memory, 640 MB maximum memory, a 500 MHz processor, and a USB port. Duplex capability is not available on this model. The 4931 Infoprint Color 1634 Express Model 4D1 has 256 MB standard memory, 768 MB maximum memory, a 625 MHz processor, and a USB port. Duplex capability is standard with this model. IBM Infoprint Color 1634 Express offers faster printing of up to 22 pages per minute (PPM)(1) letter size/20.8 ppm(1) A4 size for color and up to 24 ppm(1) letter size/22.7 ppm (1) A4 size for monochrome. The time to first print is as fast as 10.52 seconds for monochrome and 10.97 seconds for color. All models come with one 250-sheet drawer, and 100-sheet multipurpose tray standard. One 550-sheet optional drawer is supported for a total input capacity of 900 sheets. Output capacity for all models is 250 sheets. Duplex capability is only available on the models that come with duplex standard (see table above). All models have one slot for additional SDRAM memory. Memory options for the printer include 128 MB, 256 MB, and 512 MB memory DIMMs. See table above for maximum memory by model. All models have one slot for flash memory with 32 MB, 64 MB flash memory options available. There is one slot for a bar code card option. There is one interface slot for a hard disk feature. All models come with 10/100BaseTX Ethernet as standard. Optional gigabit Ethernet and wireless Ethernet are available. Ethernet connections using external print servers are also available. The maximum monthly usage for the Infoprint Color 1634 is 100,000 impressions. IBM does not recommend printing to the monthly maximum on a consistent basis. The Color Quality (CQ) enhancement, is a special print mode designed to vary the intensity of each individual printed dot by manipulating its size to produce the appearance of greater print resolution within the limitation of a set number of dots per inch (dpi). Infoprint Color 1634 Express has five Toner Darkness levels for color and monochrome. The default setting is 4. When printing in color, level 5 is equal to level 4. Refer to the table below. Note: (1) The first 30 transparencies are printed at 6 ppm, then 5 ppm. Note: If op panel is set to heavey media (>24lb), it prints at 22 ppm for first 30 pages, then it drops down to 17.6 ppm. Power Saver Mono                    90 sec. Power Saver Color                   90 sec. Note: All first copy times are measured for 4800 "Color Quality" simplex printing on letter sized paper. The test job consists of the character "A" followed by a form feed (single page job). The First Copy time is defined as the elapsed time from hitting enter on the PC keyboard to the page exiting to the output bin. All tests will pick paper from the default primary input tray and the page will exit into the default primary output bin. The Infoprint Color 1634 printable area is limited to within 4.2 mm (0.167 in.) of top, bottom, left or right edges of the media. Any information placed outside this specified printable area will not print. The printer comes standard with one 250-sheet paper drawers and a 100-sheet multi-purpose feeder (MPF). A 150-sheet (top) output bin is standard. See table below for standard and maximum media capacities. Note: (1) Lower feed reliability might be encountered when using non-standard media sizes. Note: (2) Only duplex models have duplex capability. Duplex is integrated and cannot be added to non-duplex models. Colored papers must be able to withstand 190 deg C (374 deg F) fusing temperature. Transparencies specifically designed for xerographic copy machines or laser printers may be used with the Infoprint Color 1634. During the life of the printer, components are subject to wear based on usage. Printers continuously operating at or near the maximum duty cycle may require service for replacement of these components to ensure high quality printing and good performance throughout the life of the printer. Replacement is recommended by the customer every 120,000 pages for the fuser and 120,000 pages for the transfer belt. These customer replaceable maintenance item part numbers can be found in the Ordering Information section. Note: Because transfer belt life is affected by environment, duty cycle, and toner coverage, actual page count at the end of life may vary. The printer has three unique modes of automatic calibration defined. When the engine default resolution is 4800CQ and a triggering event occurs, a "Quick Calibration" is asserted, which includes Auto Alignment and 600 dpi calibration. Conversely, when the engine default resolution is 1200 dpi, a "Full Calibration" is asserted, which includes Auto Alignment, 600 dpi calibration, and 1200 dpi linearization. Additionally, in certain scenarios, a unique "1200 dpi Linearization Only" calibration is performed. The printer performs an automatic calibration under the following conditions: 1. at power on if the printer is cold, 2. after 8 hours of Power Saver under certain conditions (if not within +/-5 deg. C of last cal., and/or more than 100 pgs. have been printed since last cal. ), 3. every 500 pages (user selectable), 4. after changing a print cartridge, 5. after changing a transfer belt, 6. after changing photoconductor units, 7. for the first 1200 dpi page received if 1200 dpi mode is uncalibrated, 8. an aborted calibration, or NVRAM reset, is detected at power on. Calibration can be manually initiated by selecting "Color Adjust" from the Quality Menu. In Black Only Mode (i.e. Op Panel Color Lockout), Auto Calibration is automatically disabled, and previous calibration values or defaults are used, depending upon the triggering event. Calibration status may be inferred from CalStat and CalSet values displayed on printed Menus pages or in Device Settings via the printer's Web server. The printer offers several controls that will allow the user or Printer / Network Administrator to direct the preferred output to be Color or Black & White. This is a printer based operation that is invoked from the configuration menu (requires POR). The user manually removes color cartridges and photo conductor units, and sets the printer to color lockout mode. This mode overrides all other modes. This is a workstation based control that can be chosen via the driver. This is a printer based operation that is invoked from the Settings menu. This mode overrides all other modes and does not require the removal of color supplies. This is data stream based remotely enabled operation. Infoprint Color 1634 offers a Color Balance Control. It is a color correction option that allows the user to increase or decrease the amount of toner going to the page individually for the cyan, magenta, yellow and black color planes. The scale for the adjustments is +5 to -5. Infoprint Color 1634 will offer a ColorSaver Mode that allows end users to print images and graphics lighter. Text will print at Toner Darkness "4", while images and graphics print at Toner Darkness "1". The ColorSaver Mode is located on the Op panel under the Quality Menu. The Color Saver feature is available in PostScript and PCL/XL jobs. Four-line160x64 pixel APA gray scale display: Non-double byte languages use a proportional font, supporting four lines with 20 characters per line maximum. Double byte characters, at 16x16 pixels in size, support four lines of 10 characters per line maximum. Non-double byte languages use a proportional font so the number of characters per line will vary. The printer has an Op Panel that has numeric keypad, backlight and USB flash drive support. It supports both Sandisk and Lexar USB flash drives. The Infoprint Color 1634 printer complies with the global safety standard for Information Technology Equipment, IEC 60950, and its country equivalents in the markets we serve. The following sections highlight the approvals and certifications that printer is expected to receive. Available via download from IBM.com. The IBM Printing Solution for Novell systems offers administrators more control over IBM printers. This all-inclusive package provides support for both NDPS and iPrint printing systems on NetWare 5.1, 6.0, 6.5 and NOES for NetWare servers. The package conists of Novell's NDPS gateway coupled with IBM's custom control snap-ins for both NetWare Administrator (NWAdmin) and iManager. By offering custom support for both NetWare Administrator and iManager management utilities, this offering allows administrators to take full control of IBM printers in a Novell printing environment. Custom drivers for Windows provide users with basic printing capabilities for their IBM printers. Built on IBM technology, custom drivers provide a solid, no-frills driver to legacy Windows environments. IBM custom drivers are available in PCL emulation and PostScript versions. Infoprint Color 1634 is compatible with applications running under the following operating systems for either local or network connections: For information about USB connections, see Local Connections. Note: (4) Printer driver support only. No support for IBM utilities. Note: (8) USB connection not available for Windows 98SE, Me and NT. NPRU will not support the Infoprint Color 1634. This utility will not support the Infoprint Color 1634. Note: Only duplex models are ENERGY STAR compliant. This will be available in the following languages: English, Danish, Dutch, Finnish, French, German, Italian, Korean, Norwegian, Polish, Brazilian Portuguese, Russian, Spanish, Swedish, Hungarian, Czech, Turkish, Simplified Chinese, Traditional Chinese, Japanese. This will be available in the following languages: English, Danish, Dutch, Finnish, French, German, Italian, Korean, Norwegian, Polish, Brazilian Portuguese, Russian, Spanish, Swedish, Simplified Chinese, Traditional Chinese. The Infoprint Color 1634 has one slot for memory DIMMs and one slot for flash memory cards. The Infoprint Color 1634 supports internal and external network cards. This feature includes a RS232C interface. This feature includes a parallel interface. The IBM Infoprint Color 1634 Express includes tools to help you control color print access, produce consistent print quality and help keep confidential jobs secure. Add wireless networking support or an additional paper tray when you re ready to boost the performance of your investment. Note:(1) The first 30 transparencies are printed at 6 ppm, then 5 ppm. Note:If op panel is set to heavey media (>24lb), it prints at 22 ppm for first 30 pages, then it drops down to 17.6 ppm. Power Saver Mono          90 sec. Power Saver Color          90 sec. Note:All first copy times are measured for 4800 "Color Quality" simplex printing on letter sized paper. The test job consists of the character "A" followed by a form feed (single page job). The First Copy time is defined as the elapsed time from hitting enter on the PC keyboard to the page exiting to the output bin. All tests will pick paper from the default primary input tray and the page will exit into the default primary output bin. Note:(1) Lower feed reliability might be encountered when using non-standard media sizes. Note:(2) Only duplex models have duplex capability. Duplex is integrated and cannot be added to non-duplex models. Note:(1) Occasional paper label use only. Note:Because transfer belt life is affected by environment, duty cycle, and toner coverage, actual page count at the end of life may vary. Note:(1) Download the latest printer drivers from IBM Web Site. Note:(2) NPDS is only available from IBM Web Site. Note:(4) Printer driver support only. No support for IBM utilities. Note:(6) Support for these operating systems only available from IBM Web site. Note:(7) System driver support only; no customer driver support. Note:(8) USB connection not available for Windows 98SE, Me and NT. Note:Using a 220 VAC to 110 VAC power converter with the low voltage model is not recommended. Note:Only duplex models are ENERGY STAR compliant.